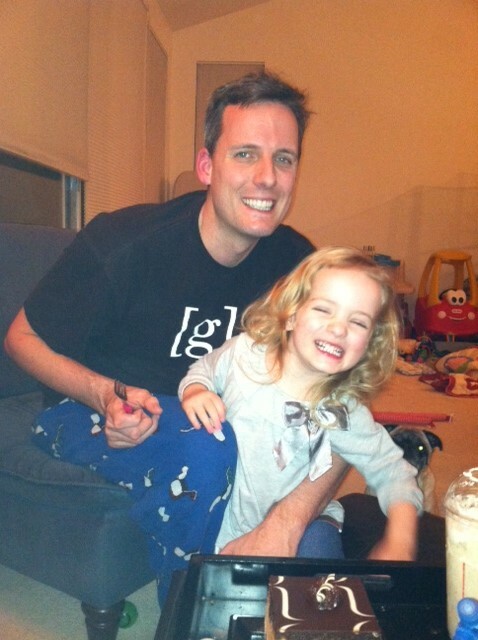 I think I mentioned this already, but on New Year’s Eve we took Addie to see her first real movie Frozen. It was amazing and she loved it! 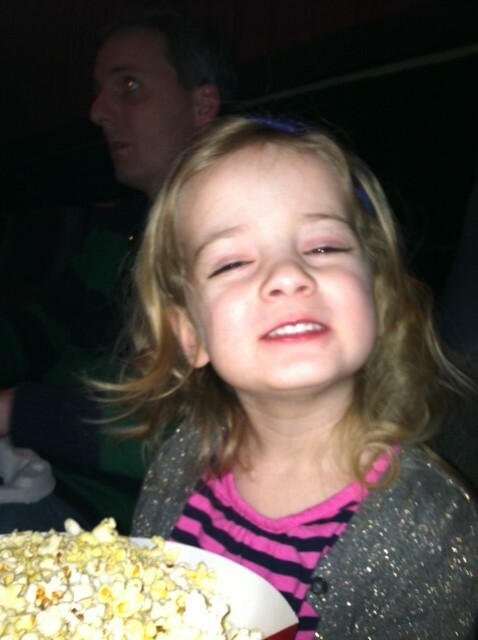 The popcorn was as big as she was and when someone asked her a few days later what was her favorite part of the movie, popcorn was her reply. 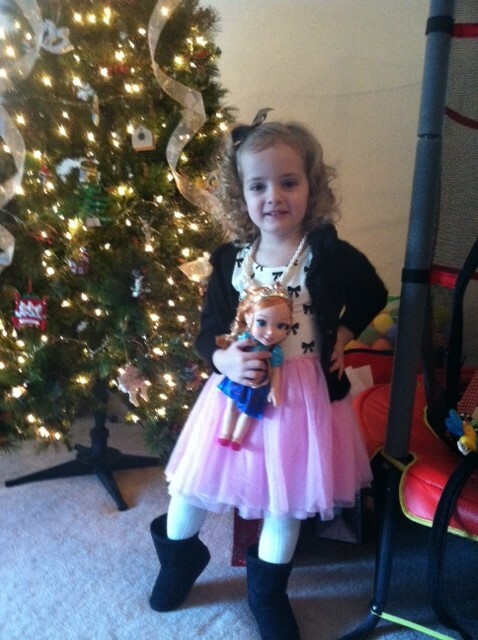 She got a belated birthday present around Christmas, a decorate your own tiara kit. We spent an entire night gluing and sticking jewels on to three paper tiaras. It was a long night letting them dry but first thing in the morning, we all were ordered to put our crowns on. Addie insisted that Beckett wear his too. Then came Olivia’s birthday. Addie has so much fun every year at this one. This time it was a bowling party. 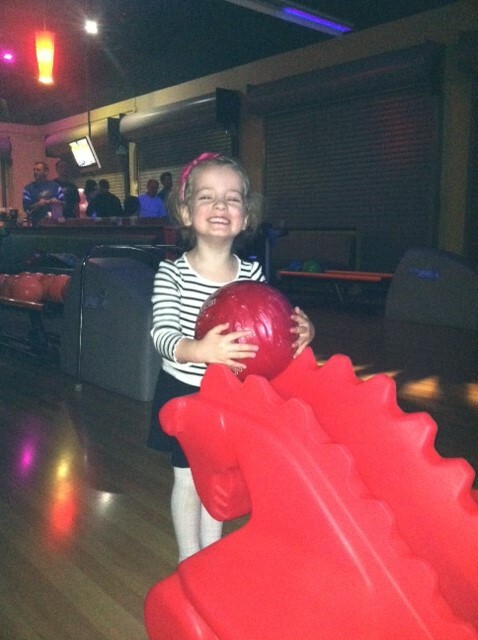 Addie had a blast her first time bowling. She even insisted on using the 10 pound ball instead of the 6 pound kid ball because it was purple. 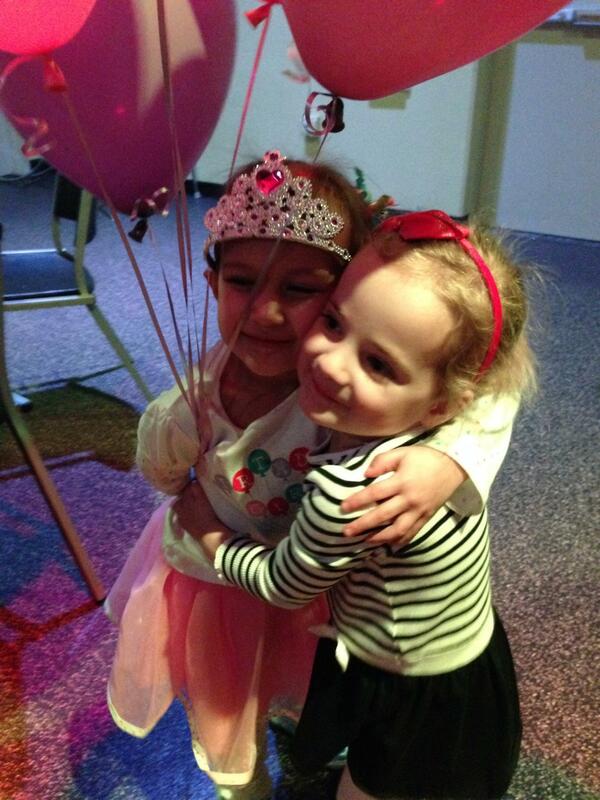 Last weekend was full of birthdays and parties. Jimmy turned 35 Friday so the kids got a night at the grandparents’ house while Jimmy and I stuffed our faces with the most delicious meal at SoDo then went to our first grown-up movie in at least 4 years. We got our first full night of sleep in ages too, then picked the kids up for a full day of parties. 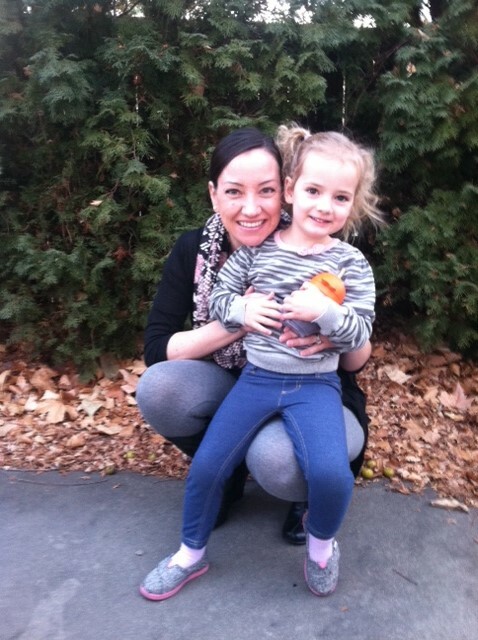 First we had one at Boomtown for Annabelle. Addie went on this ridiculously tall bouncy ride. 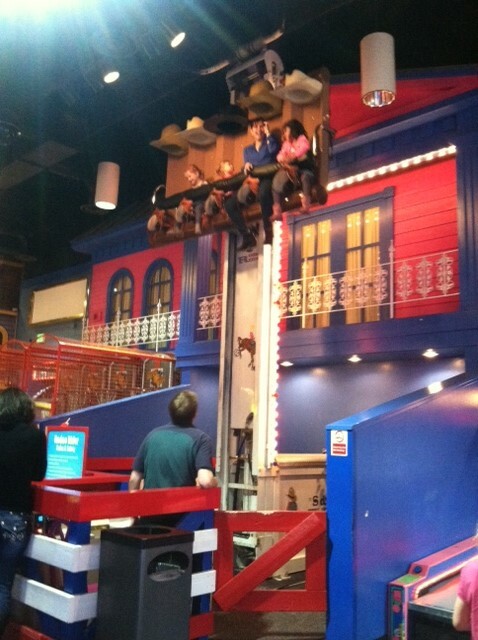 Then we went to this huge jumpy warehouse for our daycare friend Evan’s birthday. Addie was exhausted by the end of the day but somehow managed to stay awake until Jimmy and I got home from the UNR basketball game so she could sing happy birthday and have cake with her daddy. And, I realize Beckett doesn’t get near enough shout outs on this blog lately, so here he is in all his cuteness. And just some Addie randomness. She spent an entire night putting her headband over her eye and acting like a pirate…arrrrrhhhh. 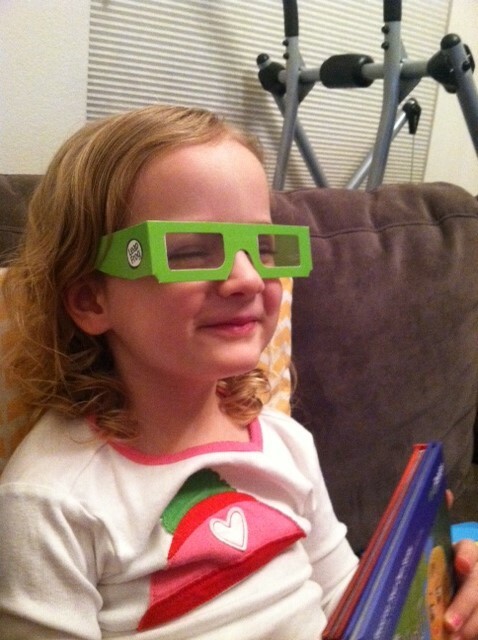 She got a leap tag reader for Christmas and one of the books is Nemo 3D. The glasses are pretty rad! 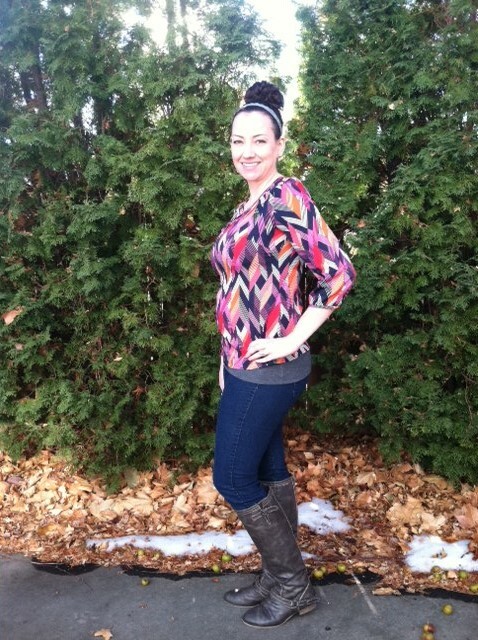 And finally, the 21 week bump. Seriously, this kid is going to be huge. I wasn’t this big yet with Beckett and was barely showing with Addie at this point. 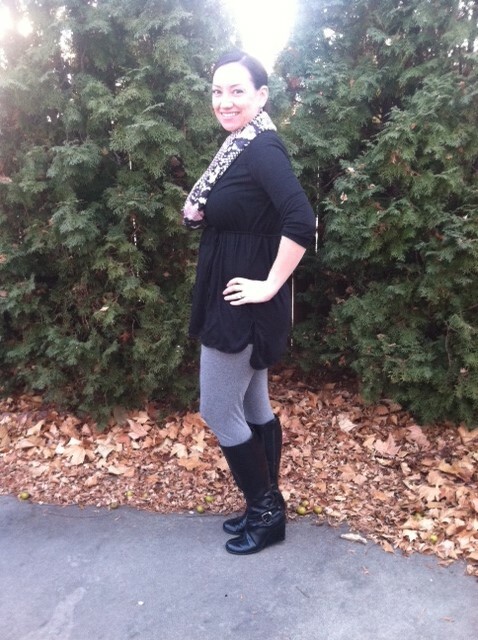 I look like I could be due in a month or so! 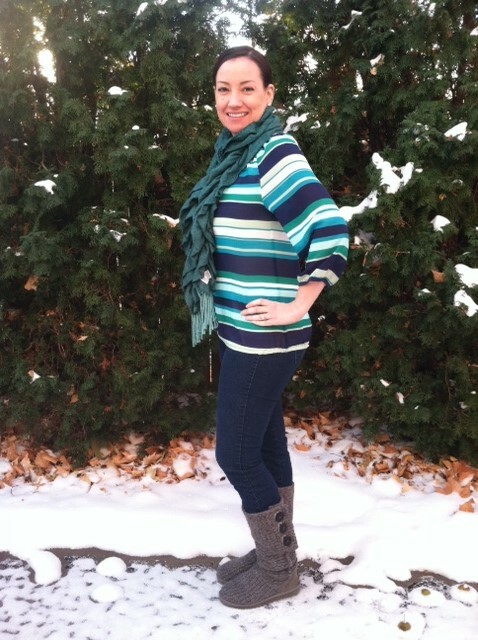 Maybe it’s just the stripes! We’re at the official halfway point with Baby G3. 20 weeks yesterday. Just a few little wiggles so far, not nearly the jumping bean that Addie was, but I’m sure that will all change soon. Jimmy and I were both thinking girl because of the super fast heartbeat but at our appointment last week, it slowed back into the 150s. Really, how accurate is that old wives tale anyway? It’s just fun to speculate! New year, new baby! 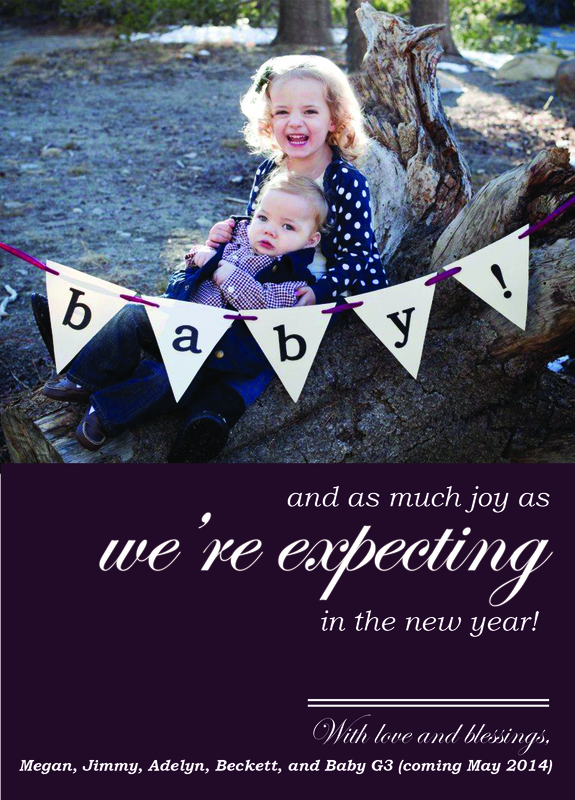 For anyone who received a Christmas card (and looked at the back) this won’t be news to you, but just in case you hadn’t heard…Baby G3 is coming! Jimmy and I found out in early October but we wanted to wait until our first trimester screening before we told anyone. So now, we’re at 19 weeks, had our anatomy scan last week and all is progressing well. No gender reveal this time around. We decided since we already have one of each, we’ll go for the delivery room surprise. Plus, we already have a complete wardrobe either way. Since we were so bad at documenting the growing bump with Beckett, we’re making an effort to do weekly pictures this time around. 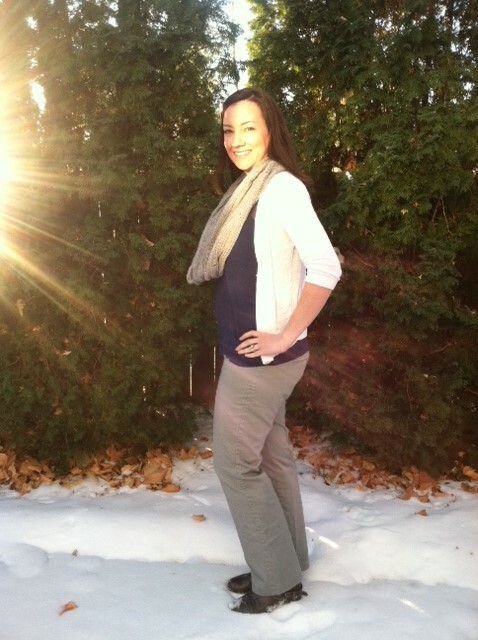 Holidays and the second trimester are a bad combo – I gained 8 pounds since my last appointment! I’ve certainly gotten a bit rounder in the last 6 weeks! I think it’s time to lay off the chocolate for a while. 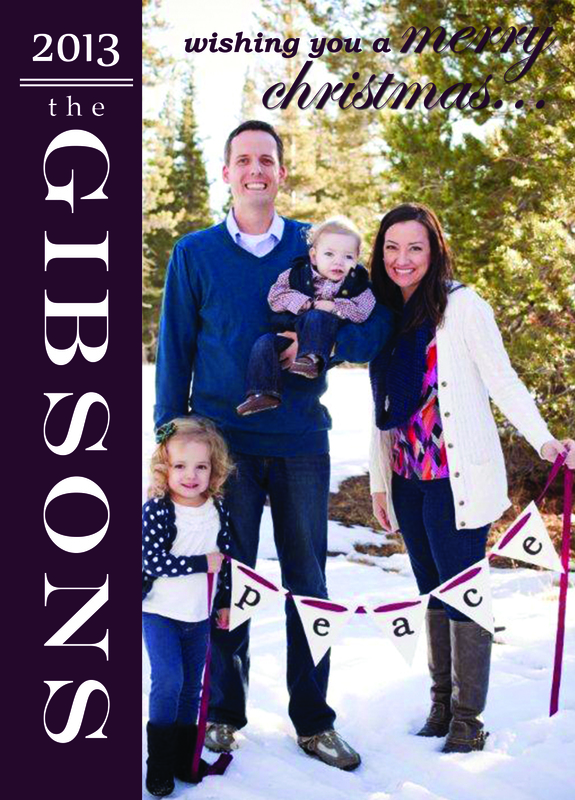 It looks like 2014 will be another exciting year in the Gibson household! Happy New Year! It’s hard to believe another Christmas has come and gone. 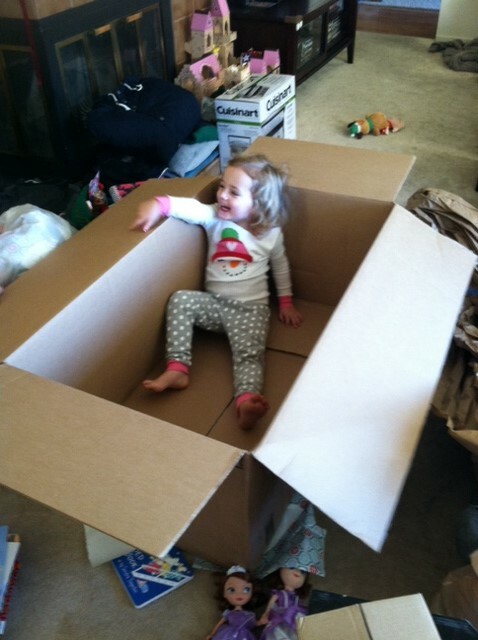 We were extra busy this year fitting in a few days in El Dorado Hills before hand. 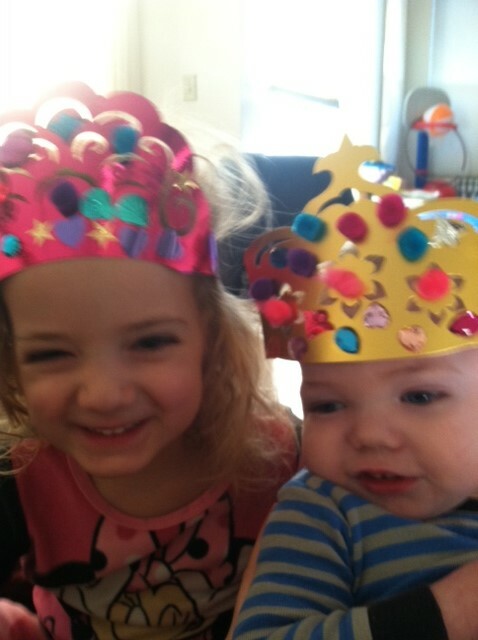 Addie and Beckett were showered with presents and had a great time playing at Nana & Poppy’s. We came home on Christmas Eve just in time to go to church and have our traditional steak and lobster dinner with my family. 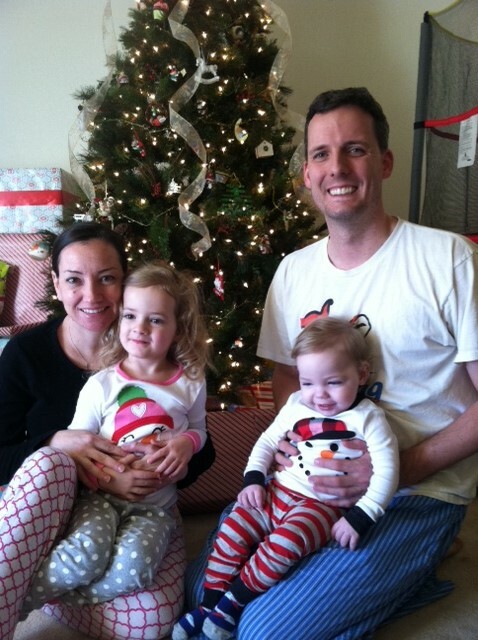 Our little Elf (whom Addie no longer calls Stella, just “Little Elf”) brought jammies and a DVD for the kids, so Addie stayed up until almost 10 pm watching a movie…that wasn’t the Grinch! Actually, we watched the Grinch every single night from Thanksgiving until about the 15th, then we recorded Tangled when it was on Disney Channel. It’s been Rapunzel every single day since then. 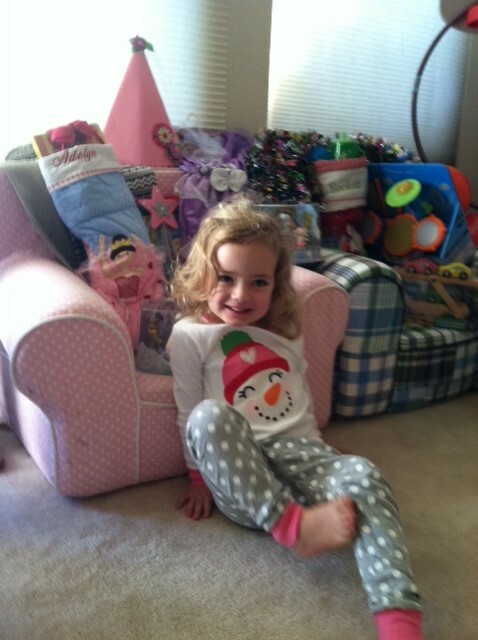 Addie woke up Christmas morning – correction…we had to wake her up! 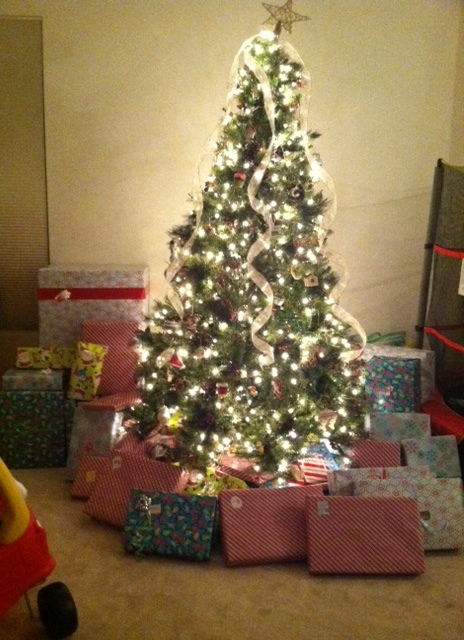 – and was super excited to see if Santa came with presents for everyone. 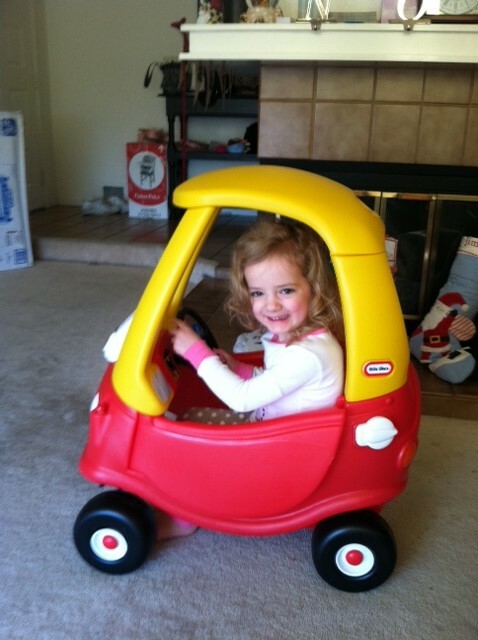 I think she was a little overwhelmed by the end but she was thrilled with her new car and a giant box. Beckett was pretty amazing all day too, smiling and being his charming self. We played and napped all day then enjoyed a lovely dinner with the family. I sure do love the holidays! !